These last few years have seen a new dawn for British Infantry troops. More individual figures and figure sets have finally started to arrive. 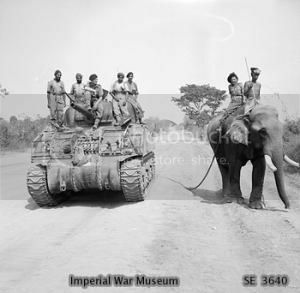 Resicast have been a leader in this field for many years, specialising in almost exclusively, but not quite, British vehicles and troops. 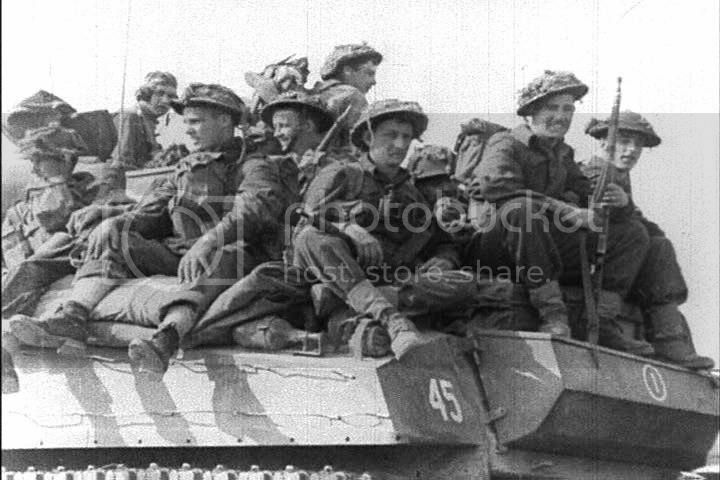 Often I have seen and heard requests for some British Infantry to passenger on tanks and HobbyFan recently released some troops to go with the AFV Churchill which were most welcome. 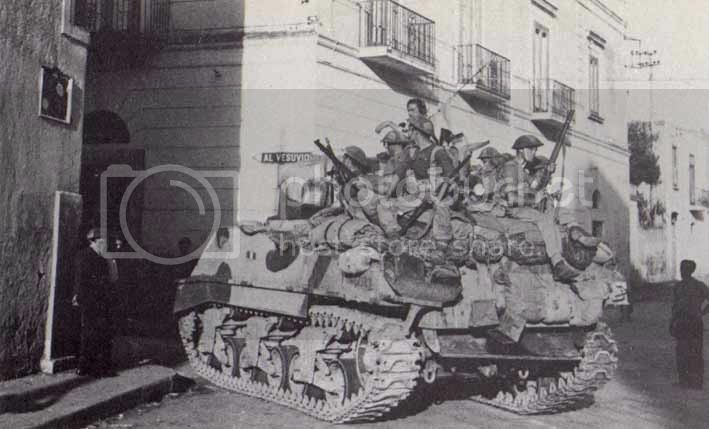 Well it never rains but it pours, and Resicast have just released 4 individual British Infantry Tank Riders. These, I believe, are the first of a series of 12 new individual figures to populate your tanks and vehicles with. 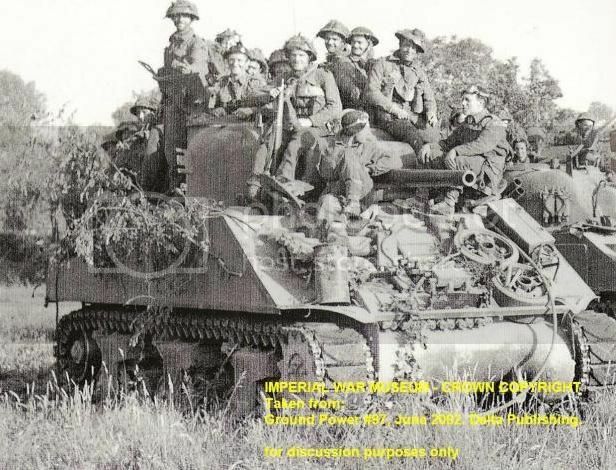 This figure comes posed as sitting on the top left hand side of a Sherman turret. The figure is bent slightly forward at the waist, left leg extended to rest on the hull top, with the right leg bent and resting on the edge of the turret. The figure is shown holding a No 4 rifle pointing down toward the left. Cast in the familiar light grey resin used by Resicast, the figure appears free from any damage or air bubble. The quality of the casting looks excellent. The figure consists of 11 parts. The body cast as a whole, separate arms, head, No 4 rifle, short stabbing bayonet, water bottle, small digging tool, back, and an alternative backpack with pick head and a separate shaft. Dressed in what appears to be a good representation of Battle Dress Serge 37/40, the uniform has the right number of pockets in the appropriate places, although the rear of the trousers show a hip pocket on the left and right, not a style I have seen before. The uniform has nice folds and creases and the pose looks very natural. On top of the uniform the figure wears a skeleton set of 37 Pattern Webbing, consisting of belt, left and right ammo pouches and braces. The webbing is very well done with nice front braces and buckles where they should be. The figure is designed to sport a back pack and the straps for that are present over the shoulders and at the sides. A very small amount of work would allow you to model this figure without the additional kit. Slung over the right shoulder and hanging across the left ammo pouch is a 50 round bandolier of ammunition containing the correct 5 pouches of ammunition. The tunic collar is closed at the top. The arms come as two separate items and are designed to hold a good representation of the No 4 rifle. The right hand is attached to the pistol grip of the rifle and the right arm has a small recess to accommodate a good fit. The No 4 rifle is nicely done with good detail. The detail on the hands is also very good. There are raised details of the shoulders of the arms for the Unit and Divisional patches, so no need for transfers unless you want to add them. The head, also a separate item, comes with a sharply cast interesting looking face, with excellent detail. On the head is a MK II netted helmet with the strap fixed at the back. The face is that of a young man looking perhaps a bit glum!! To complete the figure you get a short stabbing bayonet, water bottle in a carrier, backpack with a ground sheet tucked under the top, alternative backpack with a pick head held between the closing straps and a shaft for the pick, plus a small digging tool for the rear of the webbing. All these items are nicely done although the buckles on the digging tool holder are a bit weak, but are present nonetheless. So either full battle order or skeleton order is doable, and the alternative pack is a neat addition. I’ve been looking forward to the release of these figures since I spotted them on Hot Stuff on the Resicast site. I am not disappointed with what I’m looking at in any way. 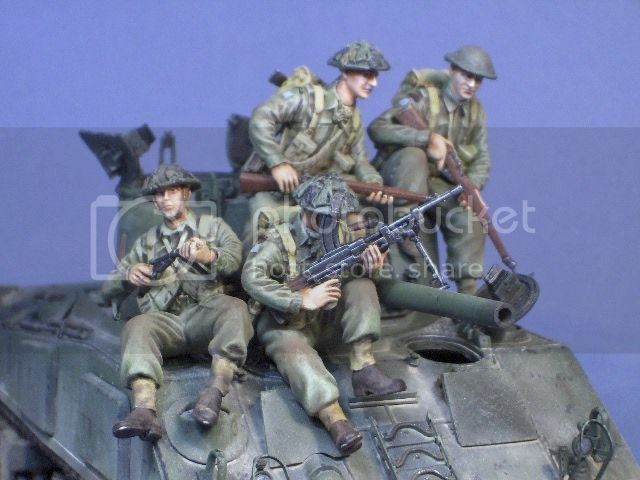 The figure is extremely well cast, the pose is one I particularly like and not only will this one fit as a tank rider but I can envisage many other uses, not only on alternative vehicles such as trucks and carriers, but within a diorama scene sitting on a wall or the window ledge of a building. Lots of possibilities here. I’ve admired Pete Morton’s sculpting for a number of years now. The figure has good body proportions with a good solid look about it. Combine that with Graham’s excellent casting and the result is a very fine figure indeed. I like the separate kit, allowing more options in the finish, and with a new hand and a switch of rifle Italy for this one would not be out of the question either. The overall level of detail is excellent, I might have preferred an open collar on the BD tunic, but that’s just me. This one should bring joy and pleasure to figure painters and diorama builders alike, an excellent addition to the Resicast range. Thanks to Resicast for supplying this item for review. Alan of all the figure reviews you have done (this the first of a series as I understand) this one interests me the most. good review and nice work Resicast.